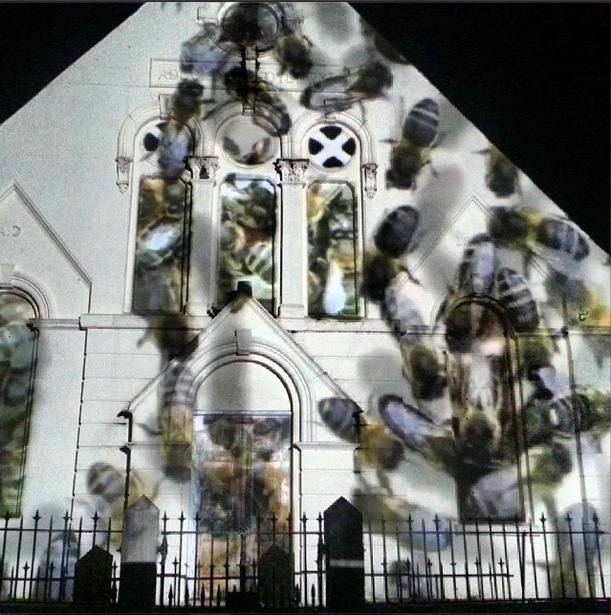 Swarm [3D projection], Wendy Leah Dawson, Blinc Digital Arts Festival 2012. ‘Swarm’ is a study into the collective behaviour of bees, and the capability of a swarm of any organism to perform complex operations that are beyond the decision-making capabilities of the individual. 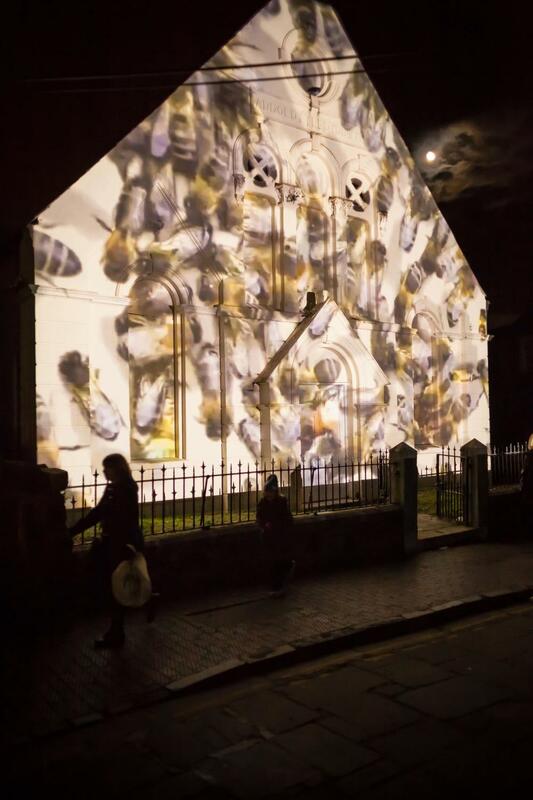 A hive rests in the centre of Conwy in a derelict Chapel, hidden from sight and busy at work, motivated to contribute without direction. The program is spontaneous, each bee has a simple job to do, yet the colony is a complex and able to make decisions without consciousness. This behaviour, as described by emergence theory, operates in nature in any number of collective situations, from ant colonies, snowflakes, cell division and social networking, each individual ant, bee, cell or human’s behaviour is influenced only by it’s immediate neighbours. Alan Turing’s work is pertinent to this piece because it brings together ideas surrounding the organic and the digital. He was the first man to consider the potential for emergence in computing, and that the repetition of simple programs would allow much more complex problems to be solved. He recognised that there was a real possibility that in the future there would be machines powerful enough to make decisions based upon multiples of simple programs, just as is seen in a colony of insects. A colony of bees, or a collection of repeated programs, can behave in a manner that implies consciousness, responding to the environment and events intelligently, can humans too display an intelligence far greater and more intuitive than that of the individual?